Or what does mindfulness have to do with horses? One of my offers for a workshop with me and my herd is a workshop on Mindfulness. If you have had anything to do with Health and Wellness, you know that Mindfulness is THE state to go for at the moment. Even though I am normally a little sceptical of hypes like that coming up, I absolutely love the idea of Mindfulness that has slowly made its way into the western realm. Not that I think the concept is a completely new one, but Mindfulness is a great way of describing it and bringing it together under one roof. And the best of it is: it describes perfectly how a horse lives! But before I get ahead of myself, what actually is mindfulness? So, why do I think that has something to do with horses? I believe horses are true masters of Mindfulness. 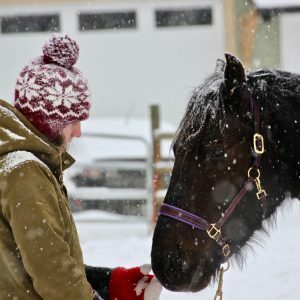 And I actually also believe that the idea of having Horse Sense has a lot to do with Mindfulness – just an older and more colloquial expression. What we often don’t realize is that we all have this ability of reading others somewhere hidden under a lot of words and theories. It is there, but we are not very apt at using it consciously and thus we don’t really trust it. I believe we all could save a lot of words and misunderstandings if we were all able to be in the moment with each other and to perceive each other’s reactions as they are in the moment as well. It’s a matter of training and who could train us better than real Masters at it? Yes, sometimes being wordless is a huge advantage. It makes room for the 90 or so other percent of our communication and creates room for thought and feeling. Welcome to a horse’s world! In many different religions, silence plays an important part in making room for “the other”. We all know that silence is really good for us, but we don’t always get there. One of the reasons why we don’t have silence very often, I believe is the idea that nothing happens and nothing gets done in silence. Horses teach us a different silence. Not just a meditation or a blocked off room somewhere but silence in the midst of everything happening. Horses work silently, they play silently, they connect with you silently. You have to experience it to really get it, but it certainly works! We all know how great it feels not to be judged – even by yourself, but we all have a very hard time to let go of all our judgements. We don’t need to get rid off our moral compass and tolerate everything to get there, horses wouldn’t do that either. I think the important thing is to focus on the intention. Horses are amazing at that. As long as your intention of meeting them, of being with them is a positive one, they don’t think twice about how you look, move, smell etc. We just have to remember that getting reactions from the horse is not personal either! If we have a lot of spring in our step because we are really looking forward to working with a horse, that might also prove too much for a certain horse. It doesn’t mean we were wrong to be energetic and happy, it just means that we might have to ease up a little to get a connection first. We tend to take reactions as a judgement that are purely circumstantial or part of a ancient survival instinct. Get over yourself and try to imagine thinking like a horse – it always helps! I had to look up equanimity, I admit. But I loved the definition: to be calm and composed, even in difficult circumstances. That is the essence of a good leader in the horse world. Being able to analyze situations and creatures in it calmly and being able to make good calls in difficult circumstances. Which brings me back to the definition of Horse Sense. Wouldn’t it be awesome if all had a bit more Horse Sense in our daily lives? I love how being with my herd reminds me of that every day – they always get me back to the basics from wherever I might be at that time. Come and join me at my barn if you want to get some of that for yourself!! Annika is very well organized when it comes to her workshops. The atmosphere with her and the horses is calm, open and inviting. The program was structured very well – each activity that we did built on the previous and ultimately concluded in an activity that put our new skills to the test. As a university student, I am constantly reminded about mindfulness from every aspect including professors, guidance counsellors and advisors, peers and parents. Through Annika’s workshop I was able to “practice what they preached” and seeing mindfulness reflected in an entirely different species so independently really solidified everything for me. 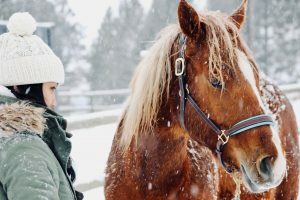 The horses provided the ultimate lesson in mindfulness and it was truly special to be able to spend the time to create connections with them and to have them teach me how to be more mindful as well. 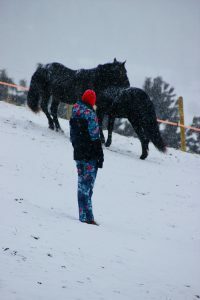 The horses help you to become more aware of not just your surroundings but yourself and your inner energy. 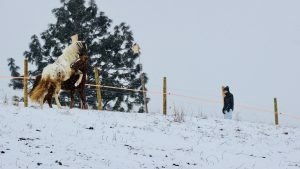 Annika really knows her horses, their lifestyles and their behaviors and is therefore able to effectively apply everything to the workshop activities. I came away from the workshop extremely calm and satisfied. Annika knows how to tailor the experience so that her clients get the most out of the workshop. I look forward to putting the skills and knowledge I have developed through Annika’s workshop to use in every aspect of my life.